Martin Caulkin was born in Birmingham in 1945. He studied Graphics and illustration at Birmingham College of Arts and Crafts. In the mid- sixties,Caulkin moved to London as a freelance illustrator and a teacher of drawing and painting. In the late seventies Caulkin's contemporary paintings started to be published in print form and distributed successfully worldwide. This allowed him to move from London to rural Worcestershire- a move which prompted a shift away from figurative painting to an intensely personal artistic treatment of landscape. 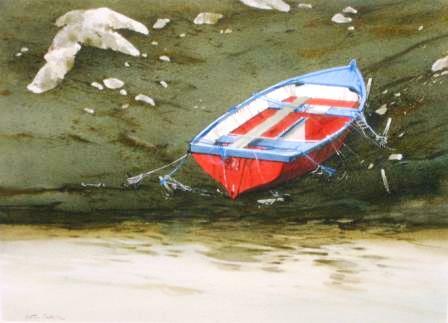 Martin Caulkin became a member of the Royal Institute of Painters and the Royal Birmingham Society of Artists in 1983.He has exhibited regularly at the Royal Watercolour Society and the RA Summer Shows. Martin Caulkin paintings have been selected for various art competitions including the Singer and Friedlander/Sunday Times Competition and are in art collections in the USA, Canada, Australia, Holland and the UK. In addition to Red Rag Modern Art Gallery in the Cotswolds, Martin Caulkin paintings are exhibited at other leading British modern art galleries.